(Nanowerk News) The American Physical Society has awarded a UT Dallas researcher one of the society’s highest honors, recognizing Dr. Yves Chabal’s development of methods to better understand processes that take place on the silicon surface that is literally the platform for the multibillion-dollar semiconductor industry. 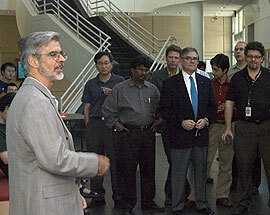 Dr. Yves Chabal (left) is head of the Materials Science and Engineering Department in the Erik Jonsson School of Engineering and Computer Science at UT Dallas. Dr. Chabal is head of the Materials Science and Engineering Department in the Erik Jonsson School of Engineering and Computer Science at UT Dallas and the first holder of the school’s Texas Instruments Distinguished University Chair in Nanoelectronics. The Davisson-Germer Prize is a biennial award given to recognize and encourage outstanding work in atomic or surface physics. Dr. Chabal was chosen as the 2009 recipient of the prize “for the individual development and collaborative application of fundamental surface infrared spectroscopy and quantum chemical methods to silicon surface reactions important in microelectronics,” according to the society’s official announcement. Dr. Chabal and his co-recipient of the award, Krishnan Raghavachari of Indiana University, were colleagues at Bell Labs, where Dr. Chabal spent 22 years prior to joining Rutgers University in 2003. The State of Texas Emerging Technology Fund’s Nanoelectronics Research Superiority Initiative was instrumental in bringing Dr. Chabal to UT Dallas from Rutgers earlier this year.